Did you know that Delphinus has a Dolphin welfare center? Scientific research is extremely important for all animals. By studying them, we can understand their behavior and know their health indicators, as well as their social patterns and feeding needs. This is how for 50 years straight we have been able to generate important information to preserve dolphins’ health. Some species still exist in the wild because they have been preserved under human care. It is a reality: without the research and conservation efforts of modern aquariums and zoos, several species would be lost by now. There are details about the intelligence of dolphins that we have not yet fully understood, like the environment in which they have evolved and their close relationship with humans. Scientific contributions are fundamental to generating knowledge; the more we understand them, the better we can meet their needs, both under human care and in wildlife. A habitat for dolphins under human care allows observation and verification of behaviors, as well as experiments to discover new aspects of these marine mammals. All information gathered from these analysis, benefits conservation. 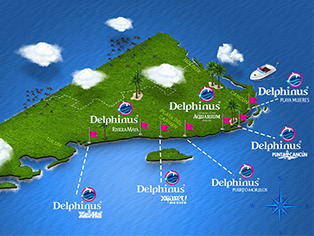 Delphinus' seven habitats for dolphin interaction are excellent places for research. We receive researchers from prestigious universities in Mexico and the rest of the world to apply protocols with which data are obtained to better understand these magnificent animals. Delphinus Riviera Maya stands out among these habitats, for it hosts the 'Animal welfare Center', which has the best technology to take care of dolphins’ health. This research area also allows us to know the state of health of dolphins and other marine mammals that get stranded, in order to give them an optimal treatment to return them to their environment. This allows us to extend our knowledge about marine mammals and, therefore, to apply it with the aim of improving their quality of life. Research allows you to protect dolphins and learn about them. Is because of these efforts that we can share all you need to know about marine mammals and their environment in order to create awareness about its welfare. We want you to come and swim with dolphins to know their habitat. You will be amazed of how in Delphinus we have learned a lot from them, as well as they have learned from us.